Today we had storms...thunder and lightning, power went out several times. Lots of wind, too, which was nice as it blew some cool air through the house! Sorted out some old paintings, re-framed and rehung a few and pondered doing something with the ole Pumpkin painting...prints, perhaps. 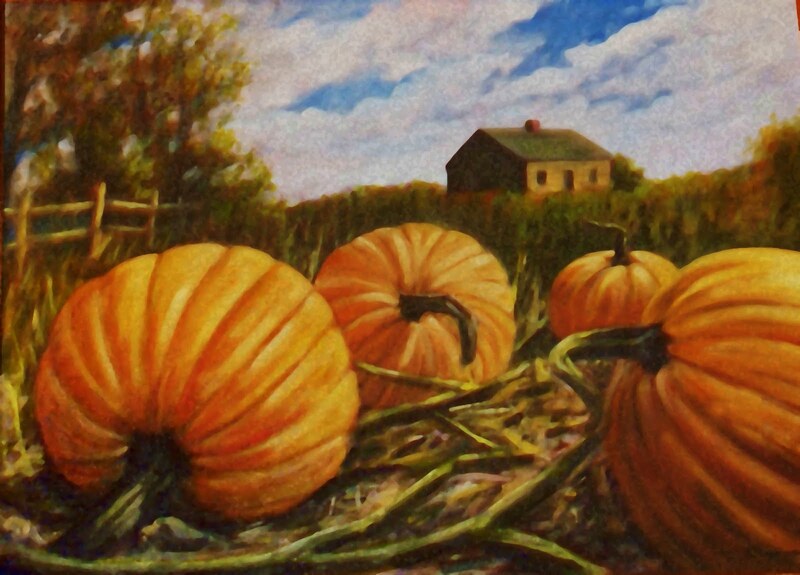 The painting also reminded me that I had planted pumpkins seeds around the herb garden. Four mounds of dirt, about six seeds in each, and to date only one has come up. I took a chance between lightning strikes to check on them...not seeing anything other than one plant coming up I dug through the remaining areas and all of the seeds are gone!!! The chipmunks, no doubt, cleaned them out. We've been infested with the critters this year and I'd rather drive them out than cause them any harm. I took one person's advice and put mothballs down the holes. I then put some dirt in each and stuck a stone in the top to seal them in. About a week later, I noticed that the holes had reappeared and piled next to each hole were what I thought was large hail...no, it was the mothballs, rolled together next to each hole as if to say, "Nice try!" I've also welcomed the neighbor's cat, figuring he'd help out...then there's the Fisher in the back yard...he must be hungry, too. But they prevail...today, the chipmunk who inhabits the underneath of the deck chattered at me as though he were telling me to go away. Just what I needed, chipmunks with an attitude. Oh well, I should be inside painting, but it was too dark with the power out and painting in the rain just doesn't work. So, I got busy putting words on paper, the old fashioned way, waiting for the return of electricity and the web and made notes to buy a new domain name for my artwork, planning on working with web hosting and soon I'll be posting old pictures and new. And, as I think about the great number of chipmunks in the yard, I'm wondering, Monet had his haystacks???? I have a chipmunk killin' cat for rent.